Header – The new header is a bit smaller than the old one. This was done to get more information onto the homepage’s initial viewing area. Rounded corners – The header, the domain count, and the main content area now all have rounded corners. Apple’s homepage was the inspiration for this change. It’s such a small thing, but it looks so much better. Domain columns – The site now omits “.com” after all the domain names because it added clutter and not much value. I’m slightly worried that some newcomers won’t understand what the domains are without the “.com” to clarify it so I added a small line below the popularity legend saying “all domains are .com” which will hopefully eliminate any confusion. With the extra space I was able to include a valuable fourth column. Also, before when a customer hovered over one of the domains its border would turn black. Now it is a dark gray, which is nicer on the eyes. Twitter – I registered @domainpigeon in November while I was working on the site but wasn’t sure what role it was going to play. Now, instead of links to blog posts, the homepage will have Twitter updates. The blog will be reserved for lengthy posts, which, at this point, I don’t see happening too frequently. Sign In Area – This was a tough one. I liked it on the homepage, but there’s wasn’t a good way to integrate it. Now, I just added a link to a seperate page that lets you sign in. I figure cookies will keep most customers signed in anyway, so its not that important to have it on the homepage. I do think that having it ont he homepage encourages more people to sign up though, so, its definitely a tradeoff. In the News – You can’t see it here, but I added a great quote from the ReadWriteWeb article on there. I also moved most of the quotes to a separate page in an effort to preserve white space. Currently, the ReadWriteWeb and the CNet quotes are the only ones included on the homepage. Registered Domain Names – Before, the top domain in this list was #1, but its actually the last domain that was registered, so I changed the numbering. The domain count was moved up to the top. Also got rid of “Members can view an additional” as it’s unnecessary information. The total is fine. I think this looks a lot more professional than the way it was done before. This also frees up space on the right column. Notice the juxtaposition of the word “explore” and “Sign Up”. 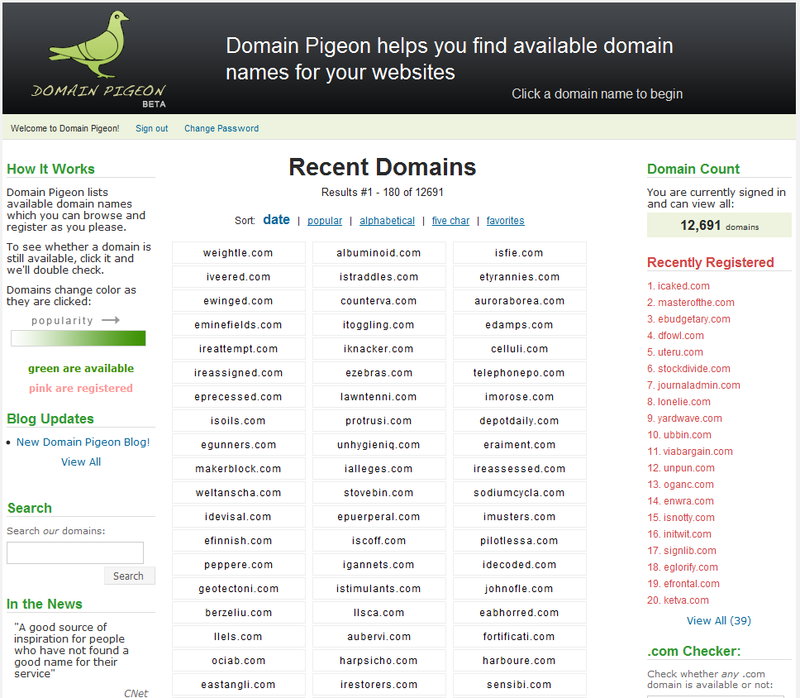 The title went from “Domain Pigeon – You’re #1 Source for Available Domain Names” to “Domain Pigeon – Available Domain Names”. I think this could still use some improvement, but I like it better than the former one, which came off as tacky. Link Usability – I noticed there was inconsistent use of underlines for the links on the homepage. They should all be standardized now. Registered domain names no longer appear along side the registered ones. This is because the 75% of the popular page was littered with pink domains, defeating its purpose. The primary font for the side columns is Lucida Grande. No more Verdana, ever. Added “Register.com” as one of the affiliates, per the request of a customer. I’m very happy with these changes and think the site looks much better now. Tomorrow I’m going to focus on cleaning up some of the code, writing more tests, and learning how to integrate credit card processing into the site. Posted on February 7, 2009 by Mazur. This entry was posted in Domain Pigeon. Bookmark the permalink.